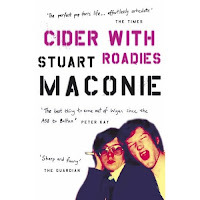 Book review in a lift - Cider with Roadies by Stuart Maconie. I've always enjoyed Stuart Maconie's writing, but this book takes a while to get going and I asked its owner (Neil Tague, business journalist of the year) why he enthused. Taguey advised me to fast forward to the NME bits. Good advice. Superb tale of journalistic shenanigans and making stuff up. Best bit: hanging out with the Happy Mondays. Initially 5/10, rising to 9/10. Bit like the NME in the 80s and 90s.